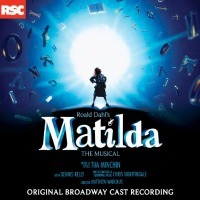 Original Broadway Cast, 2013 (Yellow Sound Label/Broadway Records) (3 / 5) Here we have a rare situation: a London cast album is actually preferable to the recording of the Broadway incarnation. While all of the new performers are as talented as their predecessors, and much is the same in terms of material (there is more dialogue included on the OBC recording, and there are some minor lyric changes), something is slightly off here. In trying to “Broadway-ize” the piece, Matilda’s creators made the show a difficult listening experience. 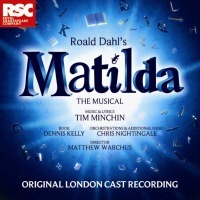 Perhaps the biggest problem is/are the new orchestrations by Christopher Nightingale; brassy and brash, they frequently overpower the singers (even on the recording), making it hard to understand Minchin’s brilliant lyrics. Perhaps to compete with the orchestra, the performances of this cast are broader, less smart, and less human than those of the British company. Even Carvel, repeating his role of Miss Trunchball, seems less funny and more fidgety than before. On the bright side, Lauren Ward as Miss Honey, also returning from the London production, is just as touching and perhaps even stronger vocally than on the previous recording. She is the sole caring adult character, and the beating heart of the show. All of the Matildas here (four of them, as opposed to the British three) are smart actresses and talented singers. Thankfully, for their tracks, Nightingale chose to remain faithful to his original orchestrations. — M.K.